Computers on the world wide web communicate with one another using a digital language consisting solely of numerical digits and periods. These strings of numbers are a computer’s virtual address through which other computers may locate that computer and communicate with it. Commonly, they are known as the IP (internet protocol) addresses. While IP registrations did simplify and categorize this process of communication, computer scientists in the 80’s agreed that it would be much easier if we could simply type in the name that served as a stand-in for the number, but was directly tied to that IP address; thus, the website domain was born. Without a website domain name system, we would need a massive internet phone book or have to memorize our favorite IP addresses. Now, if you are looking to create a business selling rare Nike Sneakers, the first step would be to build a website around this service. You would begin this by registering some name like, “Sneakerheads.com.” Now, if someone had not already registered that domain name, you would have the option to buy it. However, if it were taken, you would either have to go back to the drawing board and think of a new name or find the owner of “Sneakerheads.com” and try to purchase it from them. These days, some of the most popular domain names include, Amazon.com, Google.com, Instagram.com, Tumblr.com, and others. By typing in their name to the search bar, you get delivered to that company’s website IP address; but if you wanted to, you could also simply type in their IP address into the search bar, and that would work just as well. As you might imagine, the former is considerably easier than the latter. Because of this, if you are a starting a business or looking to create a website, it is vital that you register a domain name. Although It is a relatively simple process, it still requires some forethought and consideration to ensure you have a creative domain name for your business. We hope this step-by-step guide will help you as you register your domain name. But first, let’s dive into some of the benefits of having a domain name and the types of domains you can choose from. One of the advantages of completely coming up with a new word is that, if successful, your product is the first thing that comes to mind. Consider Twitter, Facebook, and Instagram, all made up words or amalgamations of words, but now inextricably linked to their services rendered. A good domain name accomplishes this. Choosing the right domain name, one that is SEO-friendly, can help build your brand’s authority, increase your online presence and traffic, and really make or break your company. Naturally, coming up with a name that is not only available but also a good fit is a tricky thing. Credibility – a domain name grants a business standing as an actual business and not some sort of scam. A company without a domain name will be looked at suspiciously these days, so even those people who like to “go old school” and avoid the internet, might lose customers because of fears about the business’ legitimacy. Changing Web Hosts – If you ever have to change the physical location of your web site’s files, also known as the web host, that domain name would leave with you. So if you already had customers who regularly used your site and it was called “www.fastcars.com”, they would not be affected by the site migration. Sponsors and advertisers– If you desire to utilize sponsors for your website, a domain name again gives your website inherent credence and legitimacy. Linking the name with the service– A domain name which perfectly describes your brand or business, or is intimately tied into your name makes it easier for customers to return without needing a reminder. When searching for a website, you have the option to either enter the domain name or the IP address into the search bar at the top of the search engine. Both of these will get you to your intended destination. In order to facilitate the categorization and grouping of domains into similar clusters, seven top-level domains, also known as extensions, were set apart. These extensions help to identify what the website is linked with, such as its purpose, the geographical area of origin, or the organization that owns it. Each top-level domain has a different registry that is managed by a specific group beneath the backing of ICANN. Generic top-level domains – The most common and regular top-level domains. As long as a domain name is available, generic top-level domains can be registered by the vast majority of the general public. Sponsored top-level domains – Sponsored top-level domains supervised by private organizations. .com – Abbreviated for commercial and commerce. Dotcoms are the most popular extensions used today regardless of the size of the business. We, as you likely noticed, are a registered .com. .gov – Domain name for governmental agents, officials, or agencies. .Int – Domain for international organizations. .mil – The domain for the American military and armed services. .net – The second most popular extension is mostly used by network providers such as coxcable.net. .org – An organization’s domain name, such American Civil Liberties Union (ACLU).org. .biz – This TLD can be used for businesses in place of using a .com. .info – May be used for informational sites. .mobi – Typically employed for websites that revolve around mobile devices. .travel – reserved for hoteliers, travel agents, airlines, and tourism bureaus. Obtaining a domain name requires you to register the name you desire with a nonprofit organization known as ICANN (Internet Corporation for Assigned Names and Numbers). ICANN’s charter states that it is, “Responsible for coordinating and numerical spaces of the Internet, ensuring the network’s stable and secure operation.” In order to register a domain name, you must enlist the help of a domain name registrar, which is why you are here! Domain name registrars like Domain.com have services through which you may register and then purchase a domain name. We have received accreditation through ICANN and have years of experience in helping businesses launch their websites and the process of domain name purchase and renewals are made simple through our services. The registrant’s contact info: first and last name, email address, physical address, phone number, administrative contact information and billing contact information. The chosen domain registration term. Your payment and billing information. Upon submitting this information, we will begin the registration process for your domain name. We will submit the domain name request as well as your contact information. Then, we will file this contact information with WHOIS. WHOIS is not an acronym, rather it is a system that queries, “who is” accountable for an IP address or domain name. According to ICANN, “Every year, millions of individuals, businesses, organizations, and governments register domain names. Each one must provide contact information which may include: name, address, email, phone number, and administrative and technical contacts.” This information is collected and stored in the WHOIS database. It should be noted that simply registering a domain name does not give you the rights to it forever. Domain name registrations follow something more akin to a subscription model where you can basically rent the domain name for a period of time, be it one year or multiple years. Once this time period is up, you have the option to renew the domain name registration or to let it simply expire. If it does expire without renewal, that name is now up for grabs. Therefore, it is vital that you renew your domain name registration or all the work that went into building the brand and the website might all be for nothing. You do not actually run a business registered under that name. Your company purposefully chose a name that is analogous to a different trademark or domain name, and that could lead to consumer confusion. You created the name with plans to peddle that domain to a competitor for monetary gain. No one in the company carries a name that is the same as or similar to the registered name. Competition for a nTLD (new Top-Level domain name) can be fierce, but pre-registering a domain name gives you the best shot at securing your desired domain as soon as the General Availability period begins. The General Availability period happens when a TLD has completed its launch and is now open to the public for purchase on a first come, first served basis. When you pre-register a domain name, we add your domain request to a list that will be immediately submitted to the registry the as soon as General Availability begins. Once General Availability begins for that particular TLD (Top-Level Domain), you will be notified via email as to whether or not we were able to successfully register your domain of choice. 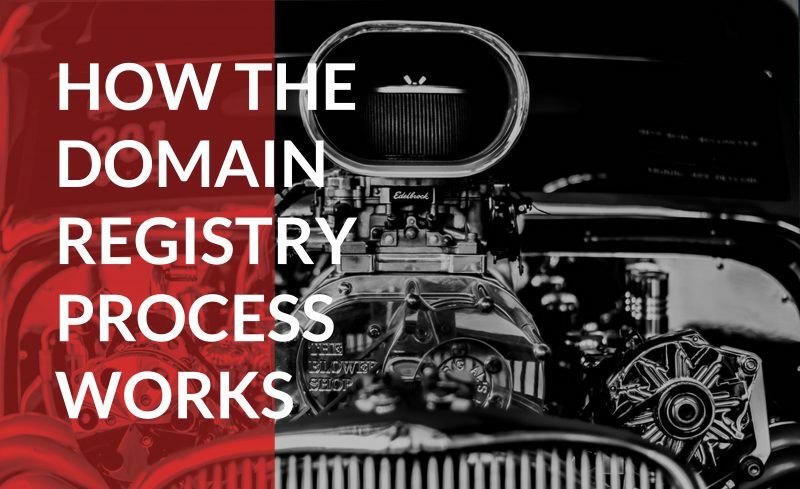 We hope this guide to registering your domain name was helpful and that we have successfully pointed you in the right direction. With all said and done, domain names are extremely important; they can help you grow your business and establish your brand. We encourage you to spend a sufficient amount of time researching your options and thinking through your domain name possibilities before making a purchase.